Passed peacefully away on Saturday, October 6th, 2018 at St. Luke’s Homes with her loving and devoted husband of 65 years, Leonard Greeley by her side. Annie was the last of the eight Roberts children. She is predeceased by her parents, Herbert and Jenny Roberts, her in-laws, Archibald and Susie Greeley; her precious grandson Dennis Mitchell. 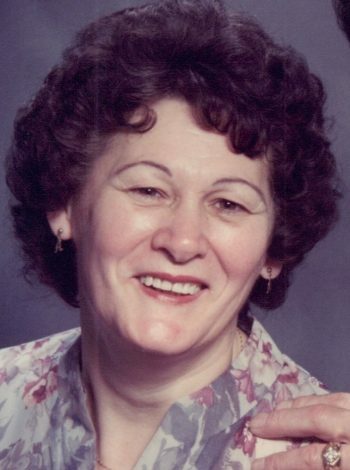 She is fondly and lovingly remembered by her children: Arch (Judy), Dolores Mitchell (Randy), Herb (Paula), Lester (Gertrude), Frank (Barb) and daughter-in-law Linda Greeley; she leaves with happy memories of her 9 grandchildren and 7 great grandchildren; 2 brothers-in-law: Leslie Greeley (Mary) and Victor Greeley (Loretta); sister-in-law Ida May Pearce; also, many nieces, nephews and friends. We would like to thank the staff at St. Luke’s Homes who treated “Nan” as they called her with such kind care and compassion. Resting at Carnell’s Funeral Home, 329 Freshwater Road from 2-9 p.m. Monday, October 8th and Tuesday, October 9th. Funeral service will be held on Wednesday, October 10th, 2018 at 2:00 p.m. from Memorial United Church, Portugal Cove. Interment to follow in Memorial United Cemetery, Bauline Line Ext., Portugal Cove. Flowers gratefully accepted or donations in Annie’s memory may be made to the Alzheimer’s Society or to Memorial United Church, Portugal Cove. To send a message of condolence, please visit www.carnells.com. Deepest condolences Leonard and family. From Shirley (Greeley) & Russell Langmead. So sorry to hear of your Mom’s passing.. So sorry for your loss. Thinking of you all as you go through this most difficult time. my sympathy to the whole family on the passing of your loved one. Your all in my thoughts and prayer today and in the days that follow. so so sorry for the loss of you mom. my deepest concolences to the family. Just letting you know that you are in our thoughts and prayers as you deal with losing your precious mother. Please take comfort in knowing that you so unselfishly gave your Mom the best care possible, she was a lucky lady to have you. RIP Ann and God Bless your Dad and all the family as you face this difficult time together. So Sorry to hear of you mom’s passing. She was a sweet lady who always had a ready smile…May she rest in peace. So sorry to hear of your mom’s passing. Your mom was a wonderful, kind hearted lady. My thoughts and prayers are with you and your family during this difficult time. My thoughts and prayers are with you all through this difficult time, I just wanted you to know that Im thinking of you she was such a beautiful woman. To the Greeley Family. We just heard about your mom’s passing. We are so sorry to hear this news. Your mom was a wonderful, kind hearted lady. It was a pleasure to have known her. Sorry we cannot be with you during this difficult time, but our thoughts and prayers are with you all. God Bless. My deepest condolences on the loss of your Mother. May she rest in peace. Hugs to all! My deepest condolences on the passing of your Mom. You are are in my thoughts and prayers at this sad time. We are so sorry to hear of Mrs. Greeley’s passing. Unfortunately we cannot be with you, but know that you are in our thoughts and prayers at this sad time. To the Greeley Family, We are so sorry to here of your mothers passing`. Our sincere condolences to all.. I have a lot of fond memories of growing up on North Point. God Bless. So sorry for your loss Herb. Our deepest condolences to you and your family. So sorry for your loss. Deepest condolences from the staff of the Labour Relations Board. Sending our deepest condolences on the passing of your Mother. She was a lovely women who I’m sure will be missed always. As I’m sure you know, we share in your grief as our mother also passed on the same day. We will cherish all the beautiful memories of our mothers. our deepest condolences on annie’s passing, god bless you all. Please accept my deepest condolences on the passing of your mother Ann may the grace of God surround you all. Arch, Judy & Family. We are sorry to learn of your Mom’s passing. Please accept our sincere condolences. Our thoughts and prayers are with you at this sad time.Take care. Leonard, Arch, Dolores, Herb, Lester, Frank and families. So very sorry to hear of Ann’s passing. I will always remember her nice smile and, as a child living next-door, her always asking if I would like to have an apple, or other goodies. Such a great lady. I will always keep those great memories. Thinking of you in this difficult time . God bless. Frank, Barb & families so sorry to hear about the passing of your mother. Our thoughts & prayers are with you during this difficult time. Thoughts and prayers to Lester and his family on the loss of your mom. Leonard and family, I’m so sorry to hear of Ann’s passing. I have fond memories of visiting her when I was next door at Nan and Pop’s house. Hugs to you all. Leonard, Archie, Delores, Herbie, Lester, Frank and families, sorry to hear about Ann’s passing. I will always remember Ann as a wonderful woman and the best neighbor. She was always so kind to us all. Hold all your memories close. Delores & Arch……May the wonderful memories of your mom you and the family share at this time give you much comfort. To Leonard, Arch, Delores, Herb, Lester and Frank you are in our thoughts during this time of great sadness. God bless you all. We remember your mother with affection and respect, she was the best neighbour anyone could hope to have. Arch, Judy and Family, Please accept our condolences on the passing of your Mom. May she be at rest. Hold on tight to the memories as they last forever! Sorry we are unable to be there in person but know we are in spirit. Blessings to all of you during this most difficult time. Take Care!